After last weekend’s Open Studio show at Fort Mason, I was busy today to setup my next show! 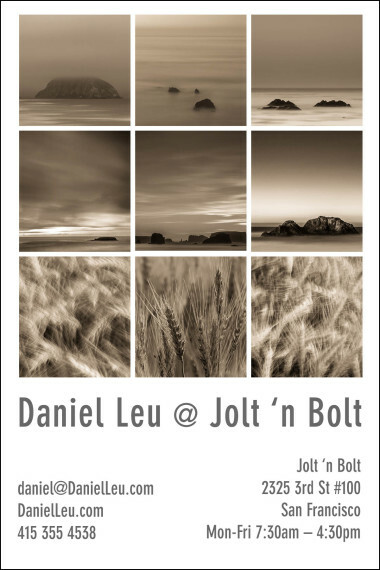 During the month of November, a selection of my Waterscape series as well as a few images from my recent trip to Washington’s Palouse region are on display at Jolt ‘n Bolt café. After you had seen my images and maybe had lunch, a coffee or enjoyed one of their delicious pastries, please feel free to stop by my office/studio on the second floor in suite #223. I have a selection of matted 11×14 and 16×20 prints from San Francisco and beyond for sale. Why not get a head start with your holiday shopping? I am looking forward to meeting you!